MEDFORD, Ore.– Honor Choir has returned to the Rogue Valley after nearly 20 years. 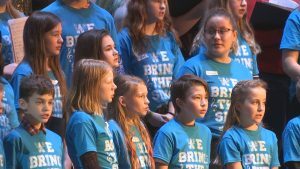 On Saturday, students from the Medford School District gathered at North Medford High School to sing songs for family and friends as the first Honor Choir event since 2000. The Honor Choir is a selection of students from across the school district that is interested in singing. Each is chosen by their music or choir teacher at the school. “It’s just a way to like express myself cause I just start singing and I forget about everything else and it’s just amazing,” said Estelle Lanning, a 7th grader from Hedrick Middle School. The young students taking part in this event have all prepared their music individually using practice tracks. Directors for the Honor Choir are excited to see this expand and hope to continue bringing this opportunity to their students.